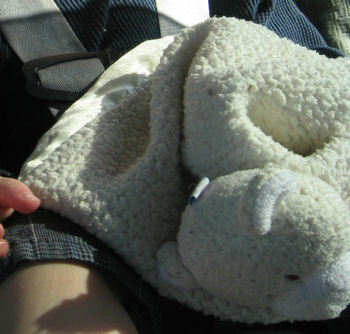 Two days ago we dropped my 1 year old son’s lovie somewhere along the way to his doctor’s appointment. I retraced our steps 3 times with no sign of it. It is a Blankets and Beyond blankie about 17″ square. It’s nubby on one side with satin trim and all satin on the other side. It has a little teddy bear head in the middle of the blanket with a bow at his neck. The color of it is beige/light tan. My son keeps looking around for it and cannot find comfort with any other blankey. I also wanted to let you know that we’d be happy with any boy “Blankets and Beyond” nubby lovie with satin on the opposite side– I doubt it has to be one with a teddy bear head. At this point I just want to find something similar!! Please, please, please I hope you can help!!! is this the same one, but in pink? We have sold the blue dog with the same kind of nubby chenille top, but she needs a beige “boy looking” blankie. The color and texture are more important than the animal. Thanks, I realize that, I was just making sure it was the right style.